Unfortunately I have been pretty busy so I knew that I needed to really manage my time to get much done this month. 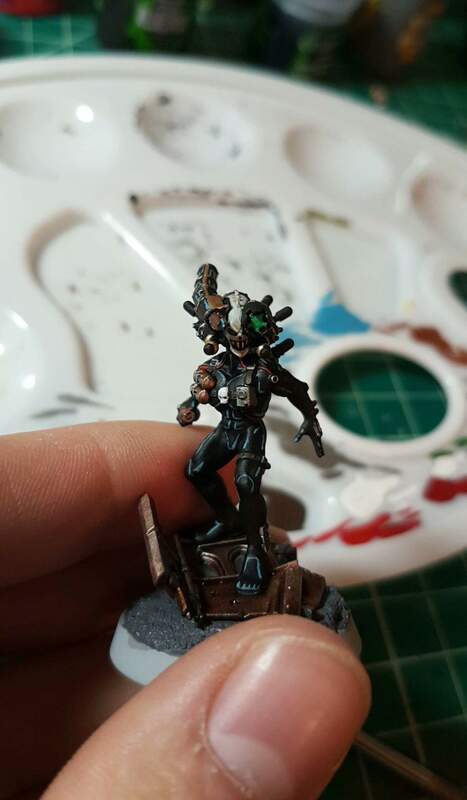 I kept focused on two projects – continuing to get my DKK up in to shape, and painting a single Culexus Assassin. 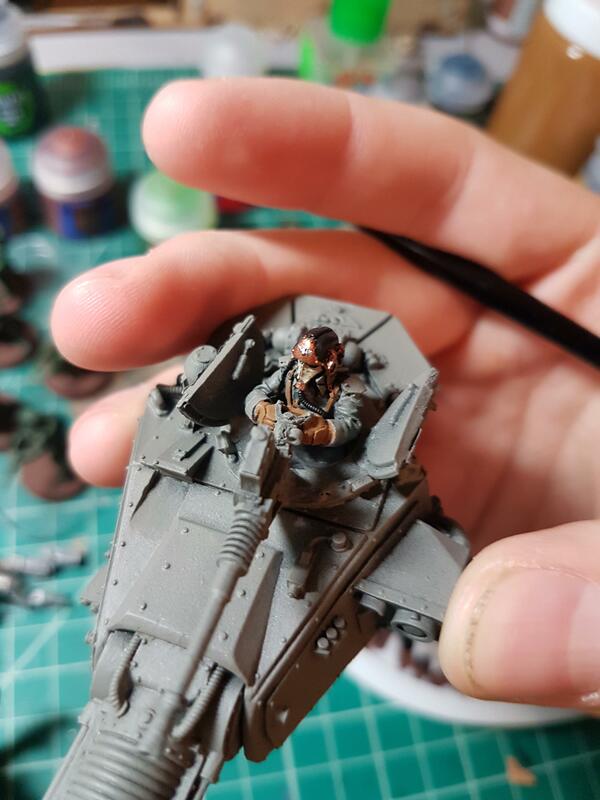 Airbrushing lends itself really well to doing vehicles, and so when my FW order got in I quickly assembled and trimmed up my Executioner Leman Russ. 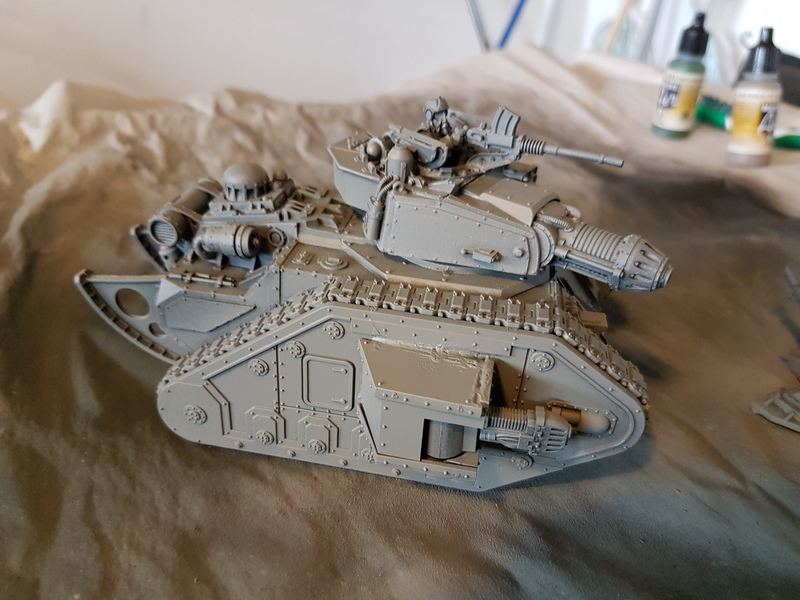 I primed with GW Chaos Black and then did two coats of IDF Sinai Grey 82 with my airbrush. I opted to go with the turret gunner going to town with a heavy stubber, mostly because it looks awesome. I later regretted plopping him in there as it makes him a pain to paint but its just another lesson learned for my next one. I am still not quite sure what I want to do with his jacket, but for now I painted up his helmet and communications gear with bronze and a silver highlight.I plan on washing the tank itself with black, then highlighting all the little rivets with bronze. I learned during work for the last entry that I could still get a really good looking figure even if I relied on the airbrush to get the primary color done. I have previously been a big fan of starting from a light grey color when I can because it allows me to minimize the number of layers of paint that I am going to need to build up to lighter colors. This saves a lot of time for those sections, but also makes it much more time consuming on figures with a lot of folds and recessed areas because there always seems to be some little spot you need to come back to. 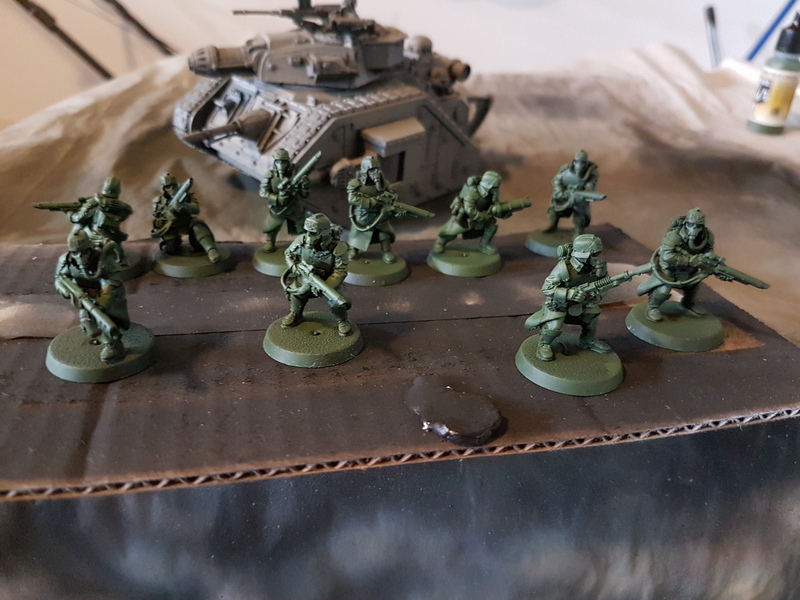 This time for the DKK grenadiers I hit them up with a single base layer of Olive Green with the airbrush and began painting from there. All 10 base coated in about 10 minutes, vs easily 2 hours with the brush painting . First little details getting done. I did an initial test fig with a copper mask but I just really wasn’t happy with it, the bone white looks much better. Most of my time was spent on putting together my Culexus Assassin though. 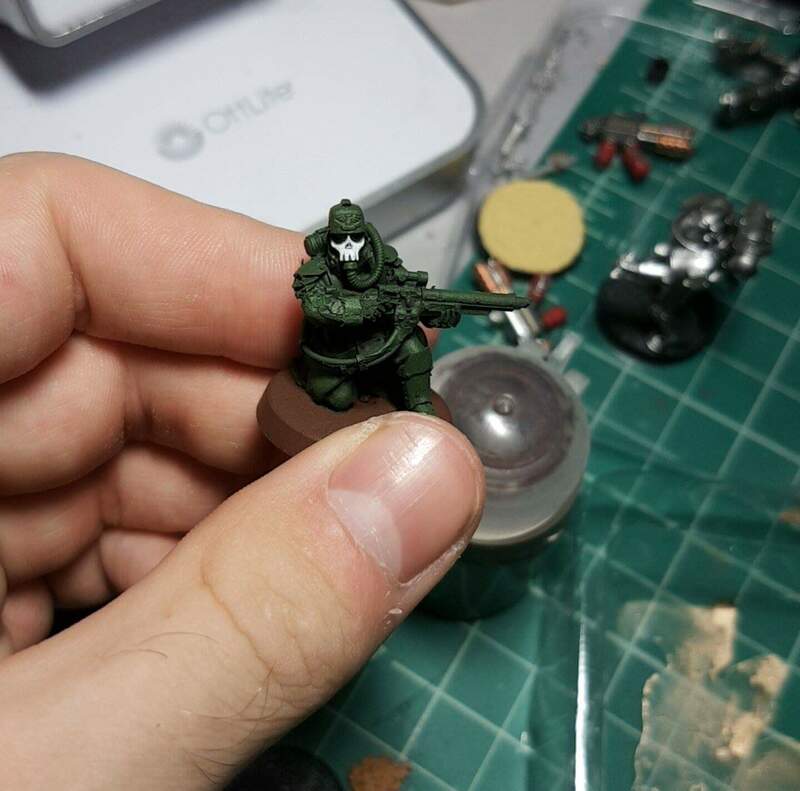 As soon as I started assembling the mini I knew that there was just no way that I was going to keep my sanity if I painted it with the humongous head already attached, so broke it down in to three pieces – the main body, the ruins base, and the helmet. I used a 00 brush to edge highlight all of the small, raised edges of the muscles and such on the body suit. The straps were base coated Rhinox Hide, washed Agrax Earthshade then given a very light highlight with Vallejo Flat Earth. 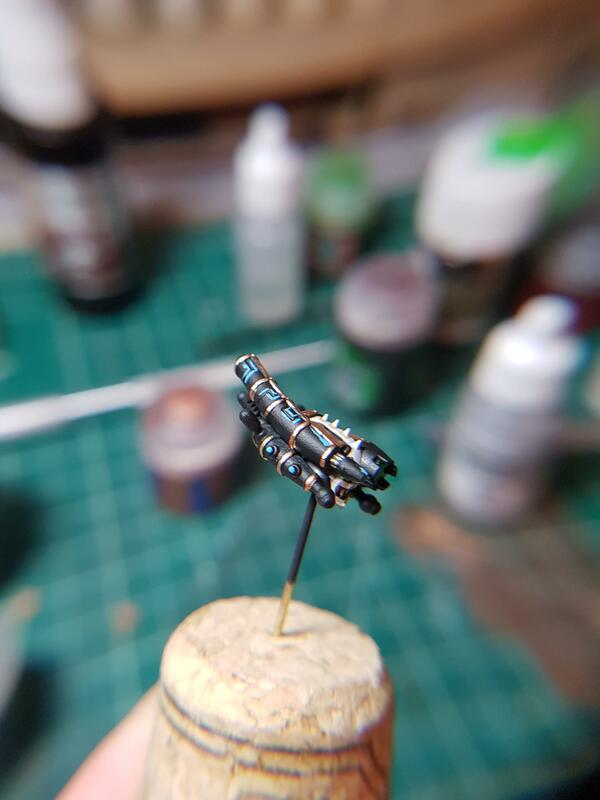 All of the small, matrix like plugs across the body were given an initial brush of Leadbelcher before giving them a highlight of runefang steel to make them shine. Finally the backpack was painted Vallejo Metallics Old Gold, and the different wire pairs were painted red and green. 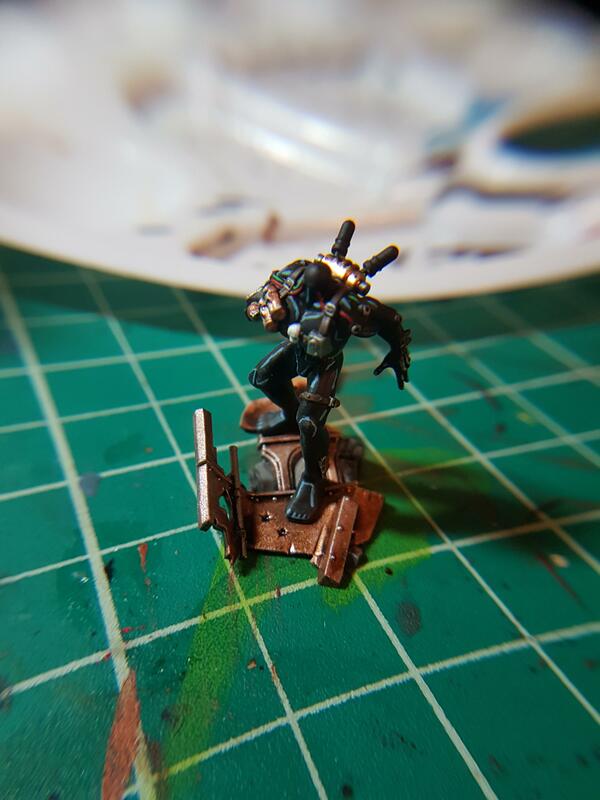 The city ruins underneath were then done with a few heavy coats of bronze, then a light drybrush with Necron Compound. Following lightening up the edges I gave it two heavy washes of Agrax Earthshade gloss, then a final highlight with Necron Compound. 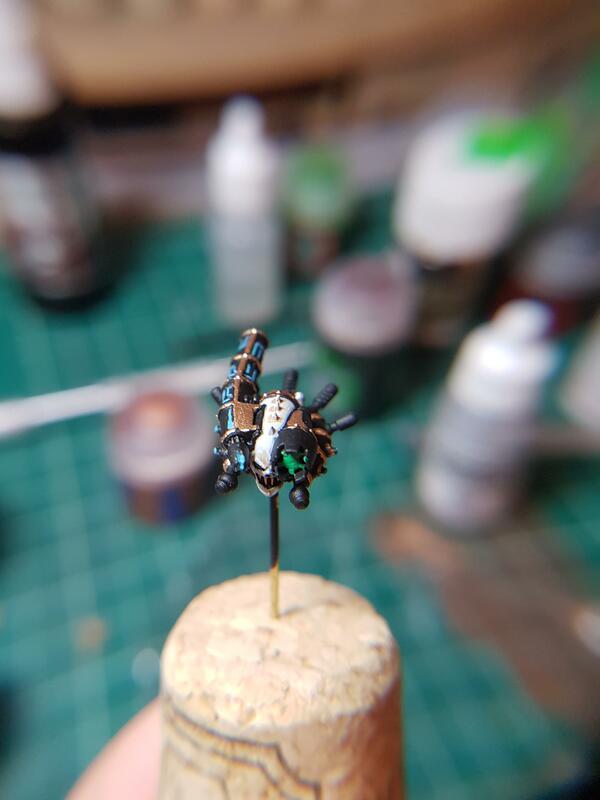 At this scale you can see how messy some of the brushwork was, but luckily when you aren’t looking at it with a camera with high zoom it doesn’t look too bad. The highlights were done with the same blue as the bodysuit and the metallic portions were painted either gold or bronze depending on how I was trying to break up the color scheme. The helmet portion itself was built up from grey to Vallejo Dead White, then it was given a very light wash with Agrax Earthshade in certain areas. You can see it in the part of the brow just above the left eye. The teeth were done in Vallejo Old Gold and then a final light green layer was put on the inside of the right eyepiece…thing. From the side. Gives a better idea of what the gold looks like in the light. And there he is all done! The base itself is still getting touched up but the figure himself just needs to be sealed up. The next three weeks is going to be spent batch painting DKK footsloggers and prettying up the Leman Russ and Siege Gun.